Hello an welcome to June's stamp of the month blog hop! 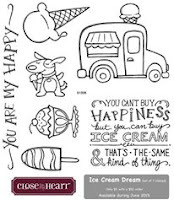 This month's stamp set is Ice Cream Dream, a set of 7 fun stamps that I can't wait to use on all kinds of projects. If you've come here from Judy Burger's blog, or if you're just starting out, you are in the right place. Just hop around our approximately 50 participating blogs until you're back where you started. For my first project with this stamp set, I made a birthday card for my ice-cream loving 14-year-old daughter. It was perfect, since we planned to give her money this year. After coloring the ice cream of one image and the cone of the other image, I cut them out. I cut the entire image with the cone colored, and only the ice cream of the other image. I mounted the ice cream on the cone using thin 3-D foam adhesive. I then applied Liquid Glass to the surface of the ice cream and, while still wet, sprinkled on some chunky gold glitter to make it look a bit like her favorite Drumsticks. I mounted my background on a black mat, then a Gypsy mat, then on to the card base. Once the Liquid Glass on the ice cream cone was dry, I adhered it to the background using more thin 3-D foam adhesive. Step 1 - use sponge daubers and your colored stamp pads to randomly place colors on the white cardstock. Let dry or blast with a heat gun. Step 2 - Using the circle templates and a sponge dauber, sponge the white pigment ink randomly on the background. Be sure to overlap some and run some off the edges for a natural look. Let dry or blast with a heat gun. That's it! Can you believe how easy that is?! I'd love to hear what you think of this project before you go. Now, let's hop along to Maria Myers' blog and see what fabulous project she has for us this month. I'm looking forward to seeing all the ideas this month! Your icecream looks so real I was almost tempted to lick it. Thanks for sharing. Your bokeh technique is terrific, and that ice cream looks good enough to eat! I'm sure your daughter loved her special card. Yum...drumsticks are one of my favorites! A good lesson in spending too! What a delicious looking chocolate ice cream cone! Oh my! - your ice cream looks good enough to eat! Great card and love the bokeh technique, looks great. That ice cream looks amazing! The sprinkles are a nice touch! Love the softness of the bokeh technique! Your ice cream stands out great! That sparkly, shiny icecream is wonderful! You make that bokeh technique look easy...and I know it's time consuming. Love it! Looks edible to me - well done! Great sprinkles on the ice cream. Thanks Cathy! Yes, I used Gypsy, Thistle, and Cotton Candy. Beautiful! Great job on the Bokeh technique and making the ice cream cone looking edible. It makes me hungry.